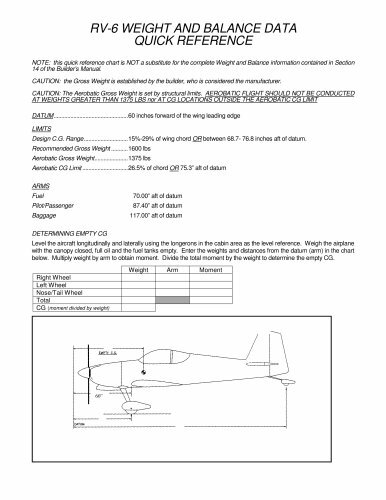 Catalogs > Vans Aircraft, Inc. > RV6wb. 15%-29% of wing chord OR between 68.7- 76.8 inches aft of datum. 1600 lbs 1375 lbs 26.5% of chord OR 75.3” aft of datum ARMS Fuel Pilot/Passenger Baggage DETERMINING EMPTY CG Level the aircraft longitudinally and laterally using the longerons in the cabin area as the level reference. Weigh the airplane with the canopy closed, full oil and the fuel tanks empty. Enter the weights and distances from the datum (arm) in the chart below. Multiply weight by arm to obtain moment. Divide the total moment by the weight to determine the empty CG.